In reflection mode, the holographic microscope can create images of dense, opaque materials, such as water filters. (a-b) Laser light from a laser diode (“LD” in the diagrams) is projected through a pin hole (“PH”) and then split into two beams by a beam cube (labeled “BC”). One beam of light hits the sample; the other does not. The beams are then reunited to form an interference pattern, which is recorded on a CMOS image sensor. (c) This photograph shows the microscope in reflection mode, with its cover removed. (The inset shows what the microscope looks like with its cover on.) The device weighs about 200 grams and is 15 cm long, 5.5 cm high, and 5 cm wide. Credit: Ozcan BioPhotonics Group at UCLA/Biomedical Optics Express. To serve remote areas of the world, doctors, nurses and field workers need equipment that is portable, versatile, and relatively inexpensive. 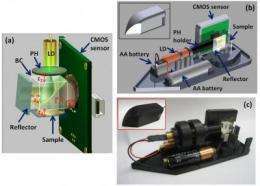 Now researchers at the University of California at Los Angeles (UCLA) have built a compact, light-weight, dual-mode microscope that uses holograms instead of lenses. The team describes the new device in a paper published today in the Optical Society's (OSA) open-access journal Biomedical Optics Express. It also has a two-in-one feature: a transmission mode that can be used to probe relatively large volumes of blood or water, and a reflection mode that can image denser, opaque samples. The spatial resolution for both modes is less than two micrometerscomparable to that achieved by bulkier microscopes with low- to medium-power lenses. 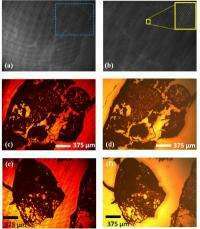 These pictures compare a piece of skin tissue imaged with the holographic microscope to the same piece of tissue imaged with a conventional microscope. The top two images (a-b) show the raw, unprocessed hologram -- the light interference pattern -- that is collected by the microscope’s sensor in reflection mode; the second image (b) is a zoomed-in version of the first (a). A computer-reconstructed image of this skin tissue is at the bottom left (c). The bottom right (d) shows a picture of the same specimen taken with a conventional, objective-lens microscope, for comparison. Credit: Ozcan BioPhotonics Group at UCLA/Biomedical Optics Express. An inexpensive light source is divided into two beams one that interacts with microscopic cells or particles in the sample, and the other that does not. The beams then pass to an adjacent sensor chip, where their interference pattern is recorded. Wow! I bet this will be an Android App within 5 - 10 years! Finally we can do some detailed analysis with modern handheld electronics! Getting closer to a Star Trek Style Tricorder all the time!